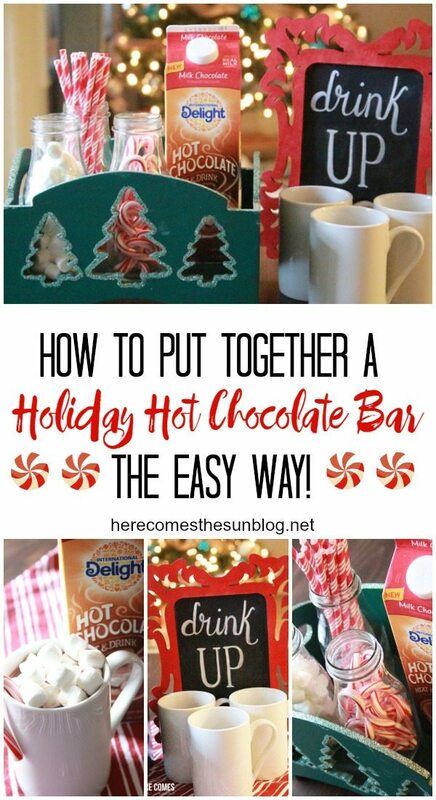 My kids have been begging for a hot chocolate bar for months. Ok, probably not for months but it sure seems that way with kids sometimes. I mentioned it once and they have been on me non-stop about it. The other day I finally set one up and surprised them when they got home from school. But let’s be honest… it wasn’t just for the kids. I really wanted one too! This was really easy to set up and you can put it together in minutes. 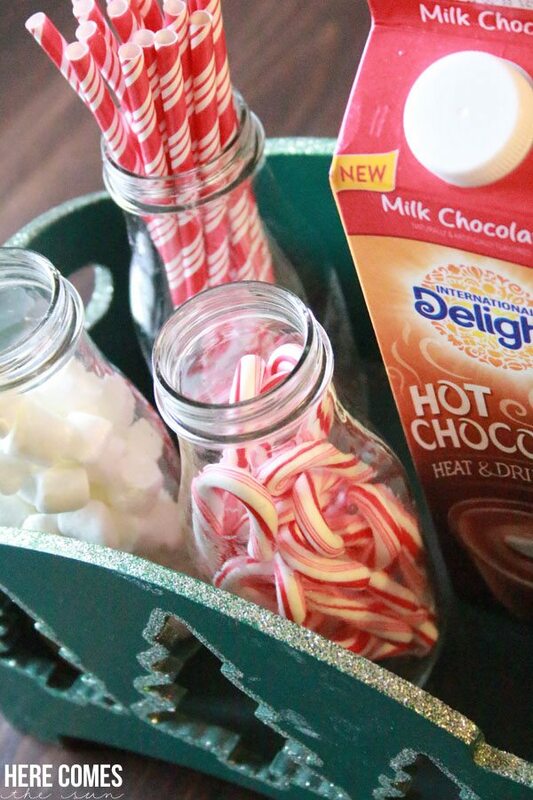 You will need a few bottles or jars to hold the hot chocolate “toppings”. The jars that I used were empty frappaccino bottles. If you don’t have them, you can use mason jars or any clear jar. I suggest using clear jars so you can see the toppings and it looks all pretty. You’ll also need a container to hold everything. The green box that I used is an old gift box that I got for Christmas eons ago. You never know when you can use that kind of stuff again. Seriously, I have it for about 10 years. You can use any container that you have. Fill the container with your bottles filled with marshmallows, candy canes and any other toppings (caramel squares would be great!) 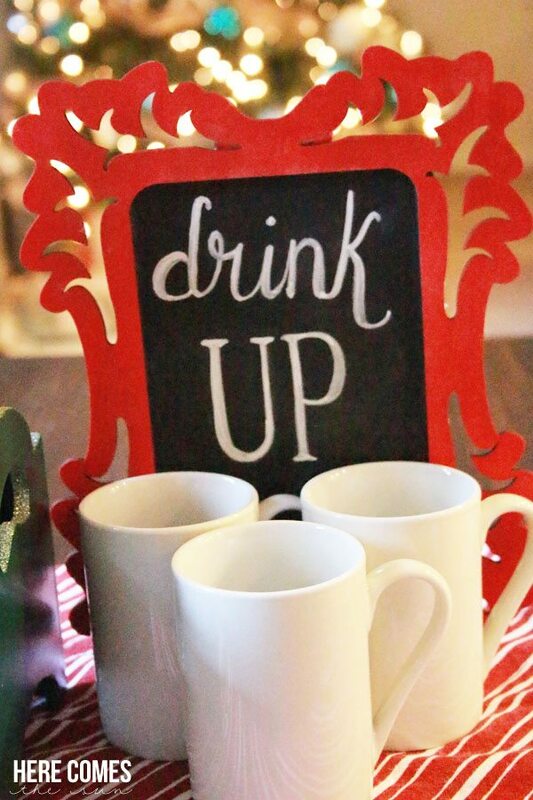 Place some mugs and festive straws next to your station. 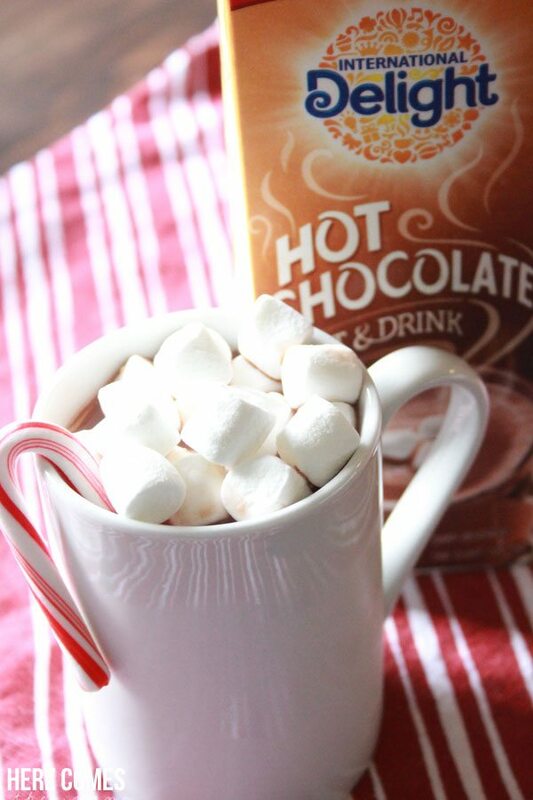 Now for the hot chocolate… I used International Delight Hot Chocolate. It comes in an easy to pour container and all you have to do is pour it into your favorite mug and warm it up in the microwave. Milk chocolate is a favorite in our house but International Delight also carries dark chocolate too. 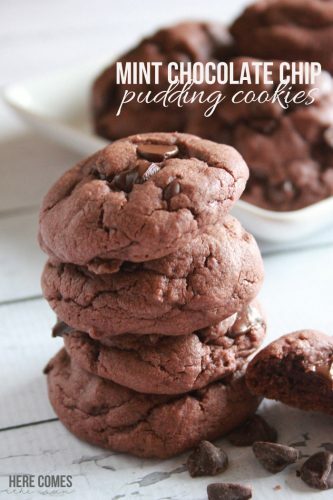 Warm up your hot chocolate, add in your toppings and you have a delicious treat. 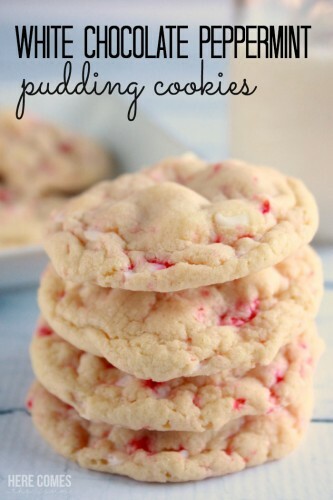 It is so decadent and creamy and just a little piece of holiday heaven. 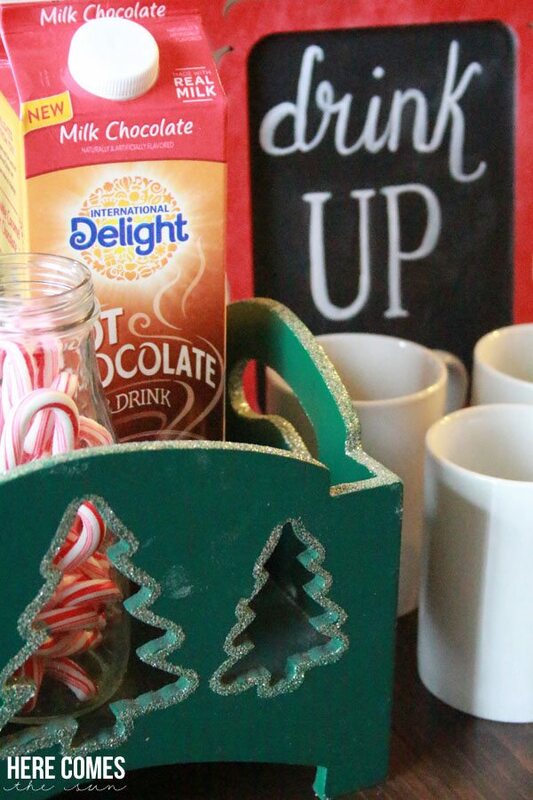 Drop some mini candy canes into your mug and let them dissolve for a great peppermint hot chocolate flavor. 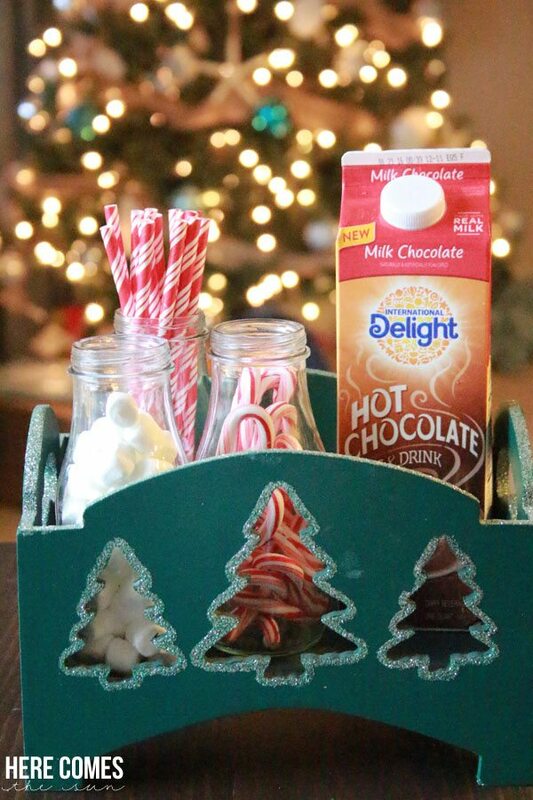 I love this hot chocolate bar because the kids can pour the chocolate themselves. Just make sure that an adult microwaves it! This works great for parties too. Since it is self serve, it makes it so easy for you as a hostess. Did I mention my son doesn’t even like hot chocolate? He drank his cold. That’s how he rolls, I guess. 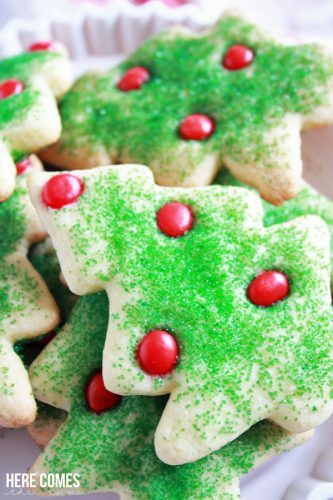 If you want to kick it up a notch, put out some of these amazing cookies on a plate next to the hot chocolate bar. 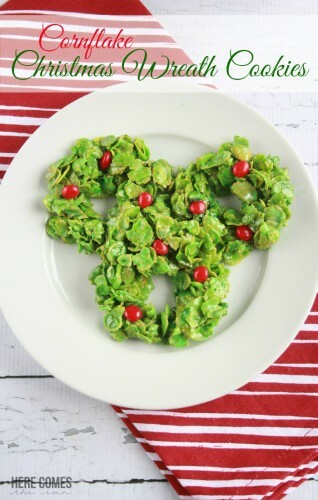 International Delight wants to give you a holiday brunch for your friends and family. 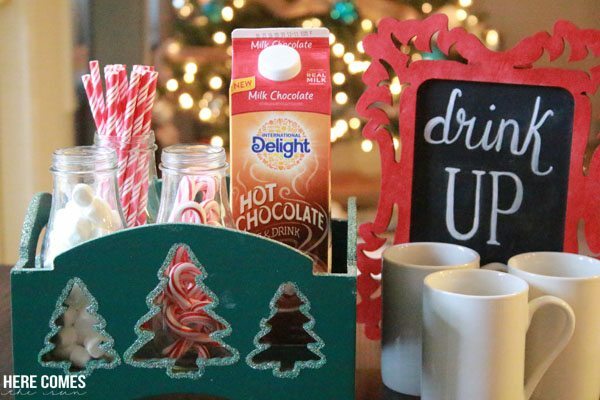 Visit International Delight and share how ID helps you capture the spirit of the season for your chance to win.